I’ve been invited as the faculty (I love being called that!) at 3 writers conferences in the late summer and fall. 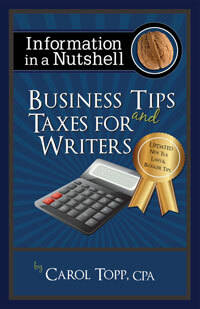 I’ll be speaking on “Business Tips for Writers, Authors and Self-Publishers” and “Taxes for Writers.” I promise it will not be boring! We color a tax return. I will also be available for individual consultations on your writing business. So if you are near IN, OH or KY, look into attending one of these writers conferences. Registration is open now. Just click on the links above to learn more.